The adventures of the little white bear called Rupert have been popular for many many years. Paul McCartney was a fan as a child, and when he realised that his own children loved Rupert just as much as he had done, it gave him the idea of creating an animated Rupert film. In 1979 he set to work writing songs for the film, but sadly it was never to be. However, in 1981 he teamed up with animator Geoff Dunbar and brought one of those songs to life – Rupert and the Frog Song. The accompanying cartoon followed one of Rupert’s adventures. Leaving his house one morning, and finding all of his friends too busy to play, he goes out across Nutwood Common to play by himself. He notices a large number of frogs all hopping along in the same direction, and follows them to a cave under a waterfall. Here he sees a series of signs stating “Frogs Only Beyond This Point” but he ignores it and proceeds to an underground lake in a huge cavern, populated by thousands of frogs. 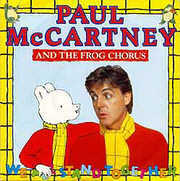 An orchestra begins to play, and Rupert watches on as the frogs enjoy a musical concert that only occurs once every few hundred years (as an old father frog, voiced by Windsor Davies says to his son, played by Paul McCartney himself). Unfortunately, Rupert was followed by an evil looking owl and two black cats, who attempt to strike at the frogs just as the concert is reaching its peak. Rupert shouts out a warning, and luckily the frogs react in time and the bad animals come away with nothing. By this time evening has set in, and Rupert hears his mother calling out for him from afar. He runs home, full of stories about his latest adventure. The video also had two bonus cartoons which were set to music by Linda McCartney. These were Seaside Woman, following the antics of a young West Indian girl as she goes about her daily life, accompanied by a rather raggy looking pet dog, and The Oriental Nightfish, a more arty, and to be honest not that child friendly a cartoon, seeing as it features a naked woman flying around the universe before exploding in a supernova. Before finishing, I’d like to point you at Matt Blank’s wonderful Rupert and the Frog Song website. It’s a labour of love packed with information and pictures, written by someone who obviously loved the cartoon and song and still does today. This entry is filed under Music - Songs, TV - Cartoons	and was posted on November 14th, 2007. You can follow any responses to this entry through the RSS 2.0 feed. You can leave a response, or trackback from your own site. I remember being in hospital when I was 5 and Rupert Bear was painted up on the wall. To this day I don’t like Rupert because I assosciate him with hospital. i remember buying this single record i still av stilllove wen i hear it songs from yester year (1980’s) are still around 2day songs from 2day r soon 4gotton about love the frog song 2 bits…… carol…..